The issue I have about using the Green Grocer is trying to figure out how to use the entire contents of the box each week. It can be tricky, but I hate throwing away food so I try to get creative. Recently, they’ve been big on onions, so this past weekend, I took advantage of the rainy Sunday to make caramelized onion jam. The beauty of this stuff is that it’s good on everything and it keeps for weeks. You can use it to top chicken or pork, add it to softened cream cheese and serve it with crackers for an hors d’oeurve, toss it in chicken salad, or my personal favorite, add it to a grilled cheese sandwich. Total perfection. It does take a while, but you don’t have to pay much attention to it so you can get other things done. I highly recommend it. Here’s the recipe (adapted from America’s Test Kitchen). Remove pot from oven and stir onions, scraping bottom and sides of pot. 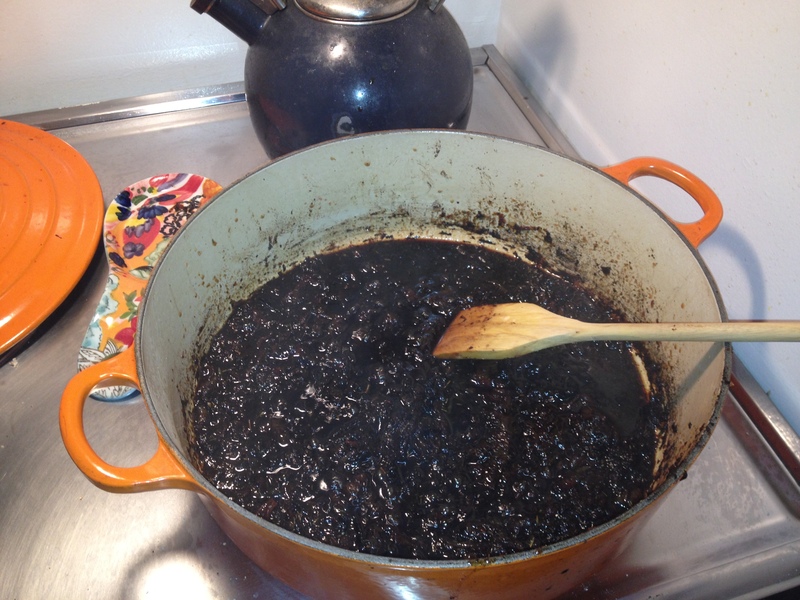 Return pot to oven, partially covered, and continue to cook, until onions are dark golden brown, about 1½ to 1¾ hours. Stir the onions and scrape bottom and sides of pot about every 30 minutes to ensure they cook evenly. Transfer onions to cutting board, let cool slightly, and then chop into rough 1-inch pieces. Put the chopped onions back into the dutch oven, stir in wine, water, sugar, vinegar, and thyme to deglaze the pan. Bring the mixture to a simmer over medium heat. Cook until liquid is reduced and rubber spatula or wooden spoon leaves distinct trail when scraped across bottom of saucepan, about 8 to 10 minutes. Season with salt and pepper to taste. 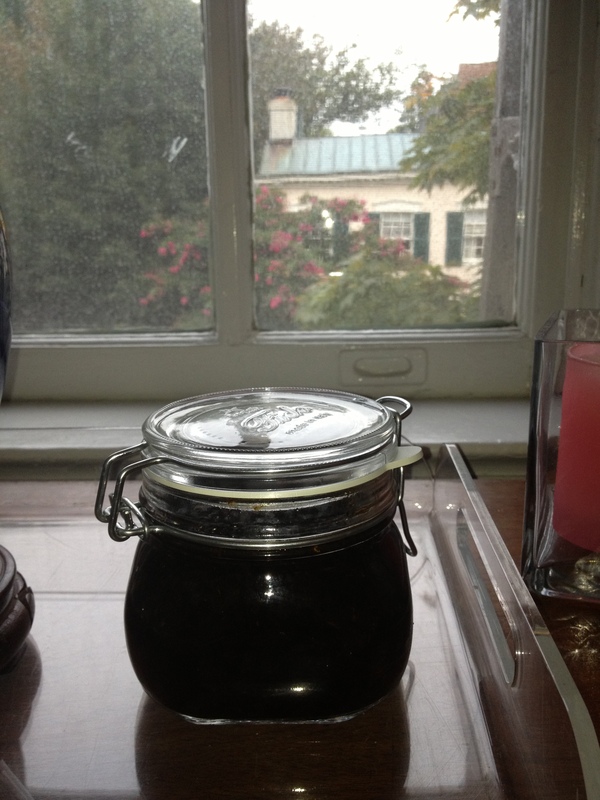 Transfer jam to jar with tight-fitting lid, let cool to room temperature, then cover and refrigerate. The jam can be refrigerated for up to 2 weeks. Bring to room temperature before using. Here is the finished product. It’s hard to imagine that all of those onions are jammed into this one little jar (no pun intended…well, maybe a little). There are a million variations to this recipe, so you can feel free to experiment as you like. Here are some other versions to get you started – try this from the Green Grocers site, this one from Oh Cake that uses sweet and regular onions , or this one which uses bourbon to add the sweet, tart flavor.